← Linguine & Meatballs; tomato soup sauce? Today was actually a nice, sunny day… The first we’ve had with no rain in a very long time. The temperature got all the way up to 15C (60F). We have not lit a fire. However, busy as mon mari was all day, I see no evidence of the gas grill being rolled out of the barn. Perhaps he is hoping for more than one nice day before he does that. Form into small meatballs, less than 1″ (2.5cm) in diameter. You should have about 32. Put 1 cup (roughly) of broth into a skillet and heat to a simmer. Add meatballs, cover and simmer until cooked, 8 – 10 minutes. Heat remaining beef broth and keep hot over low heat. Before the last 1/3 cup taste a few kernels of rice. They should be just ‘al dente’ – slightly resistant to the tooth but fully cooked. If more broth is needed add it 1/6 cup at a time and waiting until almost completely absorbed. 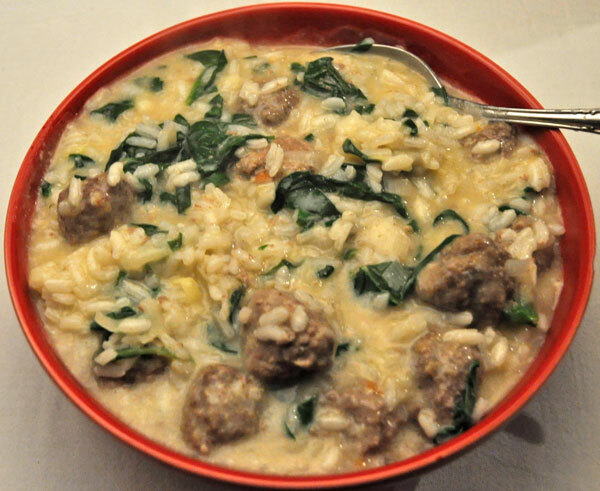 Once spinach has wilted (1 – 2 minutes) gently stir in meatballs and serve. Have you ever finished a book then pondered as to whether or not you liked it? I recently joined a book club and the current book is Wild, by Cheryl Strayed. Normally when I read a book I either like it and finish it or, as rarely happens, I don’t like it and set it aside. But, and this is important, normally when I read a book it’s one I have chosen to read. Since it’s a book club choice I will be asked to rend an opinion…. Thus my question / problem. I can’t decide if I like it. On the plus side I think it was well written. Her prose flowed and I was able to sufficiently lose myself in the story. I liked reading about the trail, the stops, and all the nature bits. On the minus side the author / main character was immature, ill-prepared and totally lacking in impulse control which irritated the hell out of me. Perhaps it needs reflection from a distance of a week or two, which I have before the next club meeting. I’ve also seen the movie, which I liked (and it only took two hours of my life). Has anyone else read it? Any opinions? I have neither read the book nor have I seen the movie, but I think your critique of the book is perfect for your book club opinion. You are on the fence about liking the book or not, and your reasons are legit! I agree with Gloria. The fact that your opinion is ambivalent does not render it illegitimate. It is what it is. As it happens, I have read the book (I did not see the movie) and I have the same thoughts as you for the same reasons. I enjoyed the challenges described as well as the natural elements, but Cheryl was not a wholly sympathetic character, although I appreciate her willingness to put it all out there and not sugar coat her reality. Love this recipe. 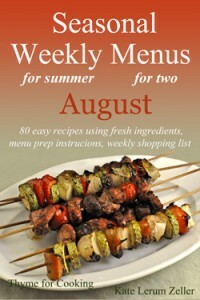 I like the use of leeks (I always use onions) and the beef broth (I always use chicken). I am so intrigued by the flavor profile here. the meatballs make it even better. My husband would really love this too. I’m with the others. Your opinion of the book is yours and should not have to coincide with anyone else’s. That’s why it’s open for discussion. One opinion isn’t any more off or on than someone else’s. I have not read the book nor seen the movie, not my cup of tea. I imagine there will be those who loved it and those who did not so it should make for a lively discussion. Stick to your opinion! Also, I cannot read books that hold no interest for me for the sake of a club, something I had a terrible time with all the way through school though I’m a voracious reader. I remember having to read a couple books for class that I hated so much, I’d have rather gouged my eyes out rather than finish them, so I no longer put myself in that position. However, if I’d been able to be honest on my book reports, it would have been marginally better. But it wasn’t. I had the same problem, I read it a while ago for a Book Club and I found the main character really really irritating but I quite liked the nature bits. I missed the meeting so I don’t know what other people thought! I like my book club, it gets me to read books I would never usually pick up, there seems to be a slight bias towards crime fiction, which I don’t usually read, so I’ve read some really interesting stories.